From the series Faces and Phases . From the series Beulahs . From the series Being . From the series Miss D'Vine . From the series Miss (Black) Lesbian . Zanele Muholi is a South African artist and visual activist. For over a decade she has documented black lesbian, gay, bisexual, transgender and intersex people’s lives in various townships in South Africa. Responding to the continuing discrimination and violence faced by the LGBTI community, in 2006 Muholi embarked on an ongoing project, Faces and Phases, in which she depicts black lesbian and transgender individuals. These arresting portraits are part of Muholi’s contribution towards a more democratic and representative South African homosexual history. Through this positive imagery, Muholi hopes to offset the stigma and negativity attached to queer identity in African society. In a more recent ongoing series, MaID (My Identity) or, read differently, “maid”, Muholi becomes both the participant and the image-maker, as she turns the camera on herself. Experimenting with different characters and archetypes, Muholi’s self portraits reference specific events in South Africa’s political history. Through exaggerating the darkness of her skin tone, Muholi reclaims her blackness, and offsets the culturally dominant images of black women in the media today. Muholi was born in Umlazi, Durban, in 1972, and she lives in Johannesburg. She studied Advanced Photography at the Market Photo Workshop in Newtown, Johannesburg, and in 2009 completed an MFA: Documentary Media at Ryerson University, Toronto. She has won numerous awards including the ICP Infinity Award for Documentary and Photojournalism (2016); Africa'Sout! Courage and Creativity Award (2016); the Outstanding International Alumni Award from Ryerson University (2016); the Fine Prize for an emerging artist at the 2013 Carnegie International; and a Prince Claus Award (2013), among others. Muholi’s work has been exhibited at Documenta 13; the South African Pavilion at the 55th Venice Biennale; and the 29th São Paulo Biennale. Solo exhibitions have taken place at institutions including the Mead Art Museum, Amherst; Gallatin Galleries, New York; Open Eye Gallery, Liverpool; Brooklyn Museum, New York; Kulturhistorek Museum, Oslo; Einsteinhaus, Ulm; Schwules Museum, Berlin; and Casa Africa, Las Palmas. Her work is included in the collections of the Boston Museum of Fine Arts; the Brooklyn Museum; the Carnegie Museum of Art; the Guggenheim Museum; the Museum of Modern Art New York; the San Francisco Museum of Art; the Tate Modern, London; the Victoria and Albert Museum, London and others. 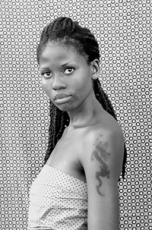 Muholi was shortlisted for the 2015 Deutsche Börse Photography Prize for her publication Faces and Phases 2006-14 (Steidl/The Walther Collection). Other publications include Zanele Muholi: African Women Photographers #1 (Casa Africa and La Fábrica, 2011); Faces and Phases (Prestel, 2010); and Only half the picture (Stevenson, 2006). Muholi is an Honorary Professor at the University of the Arts/Hochschule für Künste Bremen. May 1 - November 1, 2015. Isibonelo/Evidence, is the most comprehensive museum exhibition to date in the United States devoted to the critically acclaimed South African artist. The show comprises eighty-seven pieces created between 2007 and 2014, including the renowned Faces and Phases series, an ongoing portrait project that documents the breadth of identities contained within the LGBTI communities of South Africa. Wellcome Collection's The Institute of Sexology, London through September 20, 2015 Read more.